In the 1930s, an extraordinary woman set up shop in a modest office on Shattuck Avenue in Berkeley. Her goal? To record an ethnographic survey of California folk music, using 237 blank acetate disks supplied by the Library of Congress. Sidney Robertson Cowell traveled the state with a clunky recording device, seeking out folk musicians, from Armenian Oud players to Hungarian singers. She created a remarkable archive of recordings of 185 musicians from numerous ethnic groups, in 12 languages. The music, along with photographs and technical drawings of musical instruments, is part of a collection at the American Folklife Center at the Library of Congress. Cowell collected from people whose experiences were unrepresented, if not unrecorded at the time. She was interested in what people were singing, recognizing this would be represented in different languages, sounds, and aesthetics. She understood that California was made up of people who brought cultural repertoire from many different places. It's a remarkable inclination given that the 1930s were an era marked by such Nativist reactions as the exclusion of Asian immigrants and the mass deportations of Mexicans and Mexican Americans. Now, ACTA and the Smithsonian are teaming up with the national Latino public radio network Radio Bilingue to continue where Cowell left off. The Sounds of California project will document contemporary music through the lens of migration and immigration. The goal is to provide a lasting sound archive to be housed at the Library of Congress. ACTA supports traditional arts passed down from one generation to the next: everything from African-American quilt-making to cowboy poetry to Vietnamese opera in California. Documenting the immigrant experience through sound is a natural extension of that work, says Executive Director Amy Kitchener. The project has already started to record artists like the San Francisco-based Palabuniyan Kulintang Ensemble. They play a traditional tuned gong that predates the influence of either Islam or Christianity in the Philippines. Some of the central figures of Kulintang music in the U.S. are based in California, like Danongan “Danny” Kalunduyan. Ethnographers and folklorists with the project are also documenting performance and music that is rarely seen outside of immigrant communities. The “Diablo” or Devil dances of the traditional Mixteco dance group Nuu Yuku are one such type of performance. 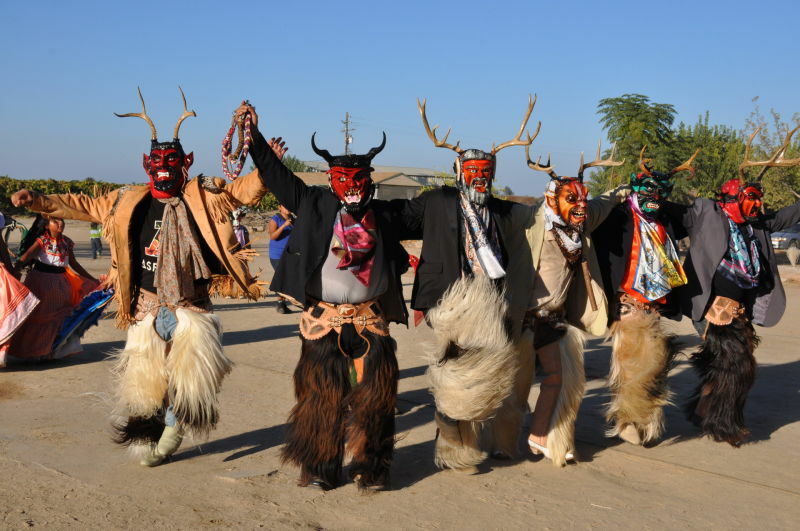 These Oaxacan dancers from the San Joaquin Valley mostly work day jobs as farmworkers, but in their off time, they perform with ornate wooden devil masks adorned with deer antlers, cracking bull whips. “A central idea is thinking about music and forms of oral expression that are part of a community, and that are valued in a community, and are parts of the identity of different groups of people in California,” says Kitchener. This includes FandangObon, an L.A.-based fusion of Son Jaracho music from Veracruz, Mexico, and the tradition of Obon dance in Japanese-American culture. “This is a really very special California sound, and reflects a lot of the way that different cultural communities collaborate and know each other here,” says Kitchener. The WPA California folk music project only had one recording from California Native Americans -- a Spanish Mission song. “California Sounds” is already filling in those gaps, by documenting the work of Vincent Medina, a storyteller from the Muwekma Olhone tribe, one of the original tribes in the Bay Area.